Seattle is known for its inclement weather and computer innovation. The climate is changing, both environmentally and technologically. We are currently shifting from our analog hard copy world and local computer storage to “cloud-based” systems. The intricacy of these systems eludes most software users and yet clouds of radio waves constantly transport masses of information all around us. The two large pixelated cloud forms above us, inspired by this evolution in technology, float over the Amazon courtyard with two solar lighting shadows imbedded in the pavement below. Neither fully transparent nor fully opaque, these “low res” clouds have select glass discs that shift between levels of opacity in a digital dance resembling old school calculating computers or perhaps pulsing lightning within clouds on a stormy night. Dan Corson’s Artwork straddles the disciplines of Art, Theatrical Design, Architecture, Landscape Architecture and sometimes even Magic. His projects have ranged from complex rail stations and busy public intersections to quiet interpretive buildings, meditation chambers and galleries. With a Masters Degree in Art from the University of Washington and a BA in Theatrical Design from San Diego State University, Corson’s work is infused with drama, passion, layered meanings and often engages the public as co-creators within his environments. He is particularly interested in green design and new technologies and how these tools can help frame and amplify the natural word and our shifting relationship to it. Among his various awards, Corson has been honored with 8 coveted Public Art Network Year-in-Review National Awards, received the NW Institute for Architecture and Urban Studies (NIAUSI prize) fellowship in Italy, and was tapped by Seattle Homes and Lifestyle as one of the top people that define Seattle Design. He has partnered with architects and landscape architects for 4 AIA Awards and 3 ASLA awards. multi-disciplinary artist and designer dan corson pays homage to the cloud in his installation at amazon’s brazil building in seattle, washington. called ‘nebulous’ the site-specific piece takes form as two large ‘clouds’ made of electronically controlled switch-glass, semi-transparent glass discs and LED fixtures. corson ties in two distinct concepts to the work, dealing with seattle’s notoriously temperamental weather patterns and digital storage. the intricacy of these systems eludes most, save for a few obvious exceptions, yet ‘clouds’ transport and store things all around us: both physically and virtually. simulated shadows of embedded LEDs are placed below the ‘nebulous’. Nebulous est une oeuvre artistique interactive imaginée par l’artiste Américain Dan Corson et présentée sur le campus Amazon de Seattle (Etats-Unis). 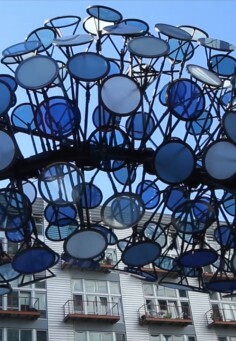 Cette installation originale en forme de nuage pixélisé se se compose de pastilles en verre qui passe du transparent à l’opaque et d’une couleur à l’autre au rythme des rayons de soleil la journée lorsque les rayons UV atteignent la structure. La nuit, ce sont des Led qui prennent le relais. A découvrir en image dans la suite de l’article.